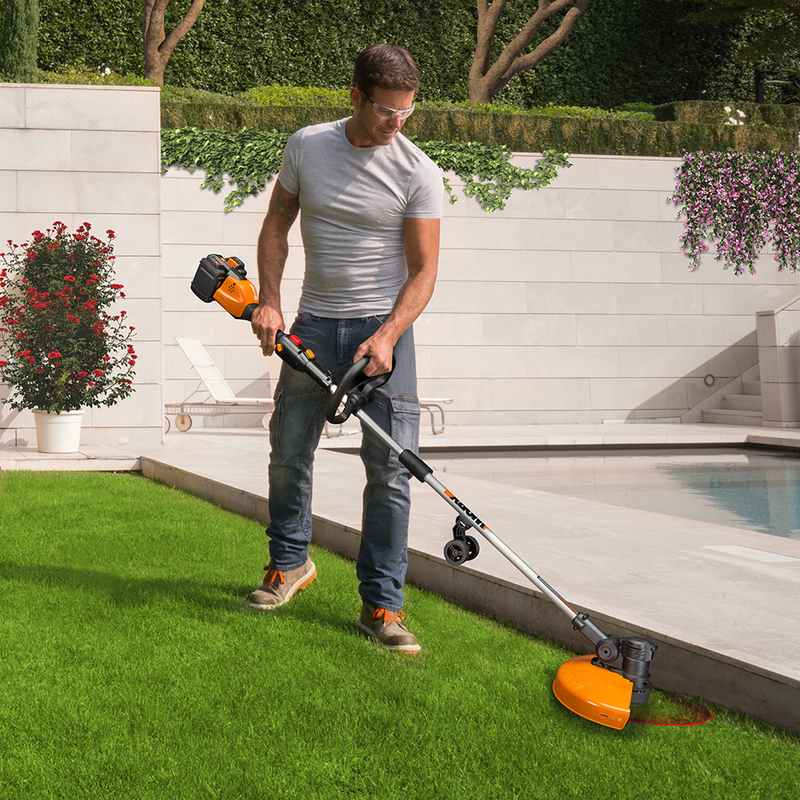 Cordless grass trimmer/edgers need plenty of dependable cutting power and torque, as well as a full complement of features, to efficiently handle the rugged lawn care tasks they are expected to perform. WORX delivers the goods with a new 40V cordless model featuring two, 20V, 2.0 Ah batteries; exclusive Command Feed line advance system; variable-speed trigger; and pushbutton conversion from trimming to wheeled edging. WORX Command Feed system advances new line to trimmer/edger’s spool at the press of a button. Cordless grass trimmer/edgers need plenty of dependable cutting power and torque, as well as a full complement of features, to efficiently handle the rugged lawn care tasks they are expected to perform. WORX® delivers the goods with a new 40V cordless model featuring two, 20V, 2.0 Ah batteries; exclusive Command Feed™ line advance system; variable-speed trigger; and pushbutton conversion from trimming to wheeled edging. The new trimmer/edger is powered by two, removable, 20V MAX Lithium, 2.0 Ah batteries. It is part of the WORX 2x20V Power Module program that combines the performance of two batteries to deliver 40 volts of power. This new 2x20V Power Module program covers several WORX yard tools. Each tool is bundled with two, 20V, 2.0 Ah batteries; a 60-minute dual port charger; three-year warranty service; and compatibility with the WORX 20V Power Share Program. Feeding new line to the trimmer/edger’s spool is totally under the user’s control with WORX Command Feed. There’s no need to bump feed or wait for more line to advance. Just press a pushbutton activator above the trigger when more line is required. Line usage is intensified during edging, when it is shredded by hitting hard surfaces such as concrete, asphalt or chain link fencing. The 40V trimmer/edger features variable speed control, which enables the user to adjust cutting speed to match the task at hand and maximize run time. It uses a snap-in spool with 20 ft. of professional .080-in.- diameter, spiral line. To help eliminate bending and stooping by the user, the trimmer/edger’s cutting head ratchets from 0 to 90°. This exclusive feature allows trimming in hard-to-reach areas such as beneath decks, shrubs and other obstructed areas. WORX grass trimmers are the only brand that has this unique capability. 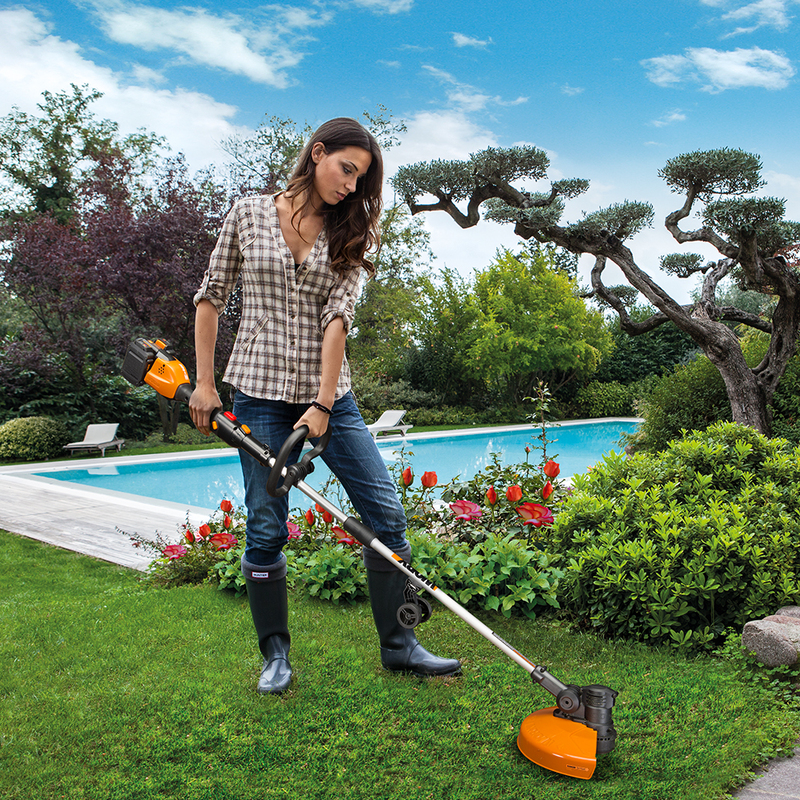 This powerful grass trimmer doubles as a precision edger. Its pushbutton twist-and-edge feature quickly and smoothly converts the trimmer into a wheeled, walk-behind edger for edging driveways, sidewalks, walkways and patios. When converted back to trimmer mode, the wheels can be stored on the shaft or removed entirely. In either trimmer or edger configuration, the 8.6 lb. yard tool is well-balanced, lightweight and highly maneuverable. For added comfort and control, it has an adjustable front-assist handle with a smooth grip. The cordless trimmer/edger has a 13 in. cutting swath and an adjustable handle to fit the users’ posture. The trimmer/edger operates at a no-load speed of 7,500 rpm, driving a single, durable line through grass, weeds and light brush. Line installation is fumble-free because WORX incorporates a quick-change, snap-in spool system. The WORX 2x20, 40V, Trimmer/Edger (WG184, $149.99) includes two, 20V 2.0 Ah MAX Lithium batteries with fuel gauges, one 60-minute dual-port charger and two spools of line. 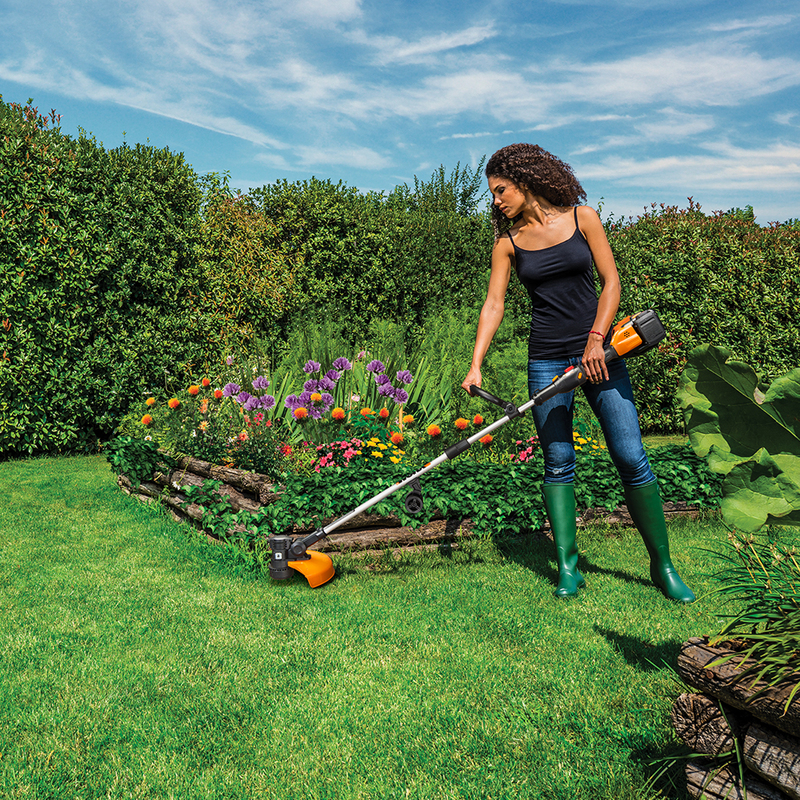 The trimmer is covered by the WORX three-year warranty. It is available at http://www.worx.com and Amazon. WORX 2x20, 40V, Trimmer/Edger combines performance of two batteries to deliver 40 volts of power. WORX 2x20, 40V, Trimmer/Edger has 13 in. cutting swath and adjustable handle to fit users’ posture. WORX 2x20, 40V, Trimmer/Edger features variable speed control, enabling user to adjust cutting speed to match task and maximize run time.